It seems pretty common to hear that gold makes a good hedge against inflation. At first I accepted this concept without any examination. It just seemed to "make sense". But then I thought about what I'd seen gold prices do in the past and I didn't really see much there that showed gold prices correlating to inflation. There is a period in the 1970's when gold went up and inflation was high. But thats just one decade. Other than the 70's I haven't seen any real relationship between gold and inflation. Do you see a very strong correlation between those lines? I don't. Gold prices seem to bounce all over. If there were a direct correlation between gold and inflation in time periods of a few years you'd expect to see stronger correlation between those two lines. Here is a very detailed and interesting examination of the relationship between gold and inflation: Is Gold an Inflation Hedge? A professor looked at the relationship between gold and inflation over a 17 year period and concluded: "What the above tells you is that the widely held belief that gold goes up when the dollar goes down is not supported by the statistics: a -0.28 correlation is a weak correlation at best and is certainly within the normal volatility that these two date series exhibit." 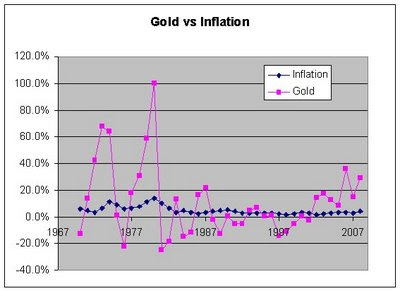 That same article has a nice graph showing how from the 1970's to about 2000 the price of gold went down overall while inflation consistently drove prices up. That is opposite to the idea that gold is a good inflation hedge. If gold were a good inflation hedge then the price of gold would have gone up steadily decade over decade. But from 1980 to 2001 the price of gold dropped. I don't see any strong evidence that gold is a dependable inflation hedge for any short term periods.